A unique system of underground rivers and caves on the Yucatan Peninsula, cenotes are shrouded by a sense of mystique and awe. These sinkholes are underground or partly sheltered by rocks; others look like rocky, shallow ponds. You can explore the cenotes by scuba diving, kayaking or swimming on your own or via guided tours. Be prepared for some very cold water! Cenote Azul is a popular cenote just south of Playa Del Carmen in the Riviera Maya. Here you can enjoy exploring this natural area and taking a dip in its refreshing waters. It is an ideal spot for kids because there are many places to safely stand in the water. There are deeper parts where you can swim, as well as a cliff jump of about 15 feet. 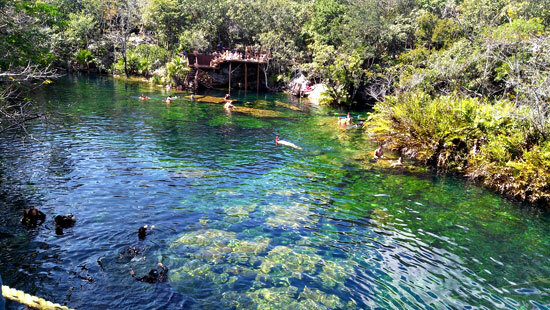 A short distance away is Cenote El Jardin Del Eden. This cenote is open and makes for a lush surrounding area with plants growing in the water and rocks covered in moss. 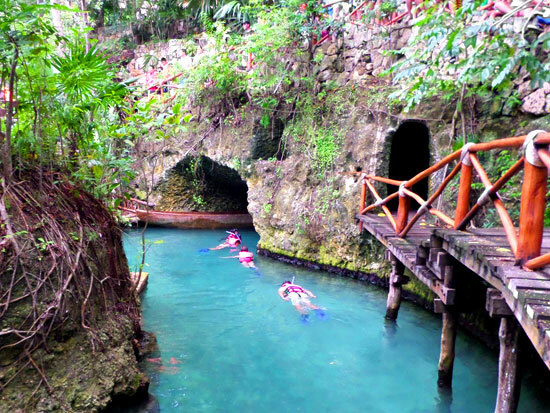 Nearby is Cenote Cristalino, which has a half-cave you can swim through. The Mayan Riviera’s coast runs parallel to one of the largest reef systems in the world. Any hotel/resort will run tours—most leave right from your beach. You’ll take a zodiac a short way out to the reef, get your fill of snorkeling and be back in less than two hours. The sacred site of Chichen Itza, which means “at the mouth of the well of Itza,” is one of the most important examples of the Mayan-Toltec civilization in Yucatán. 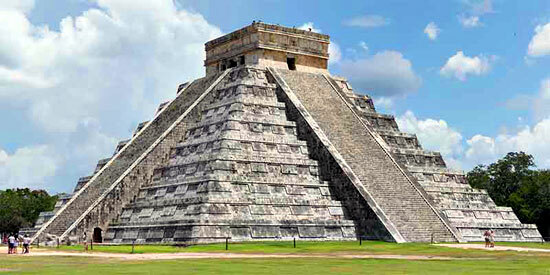 The Kukulkan Pyramid in Chichen-Itza is considered one of the new seven wonders of the world. Other archaeological sites to visit include the Warriors’ Temple, El Castillo and the circular observatory known as El Caracol. Tulum is a smaller collection of ruins right on the coast. An easy half-day trip, this site reveals a lot about the Mayan way of life. 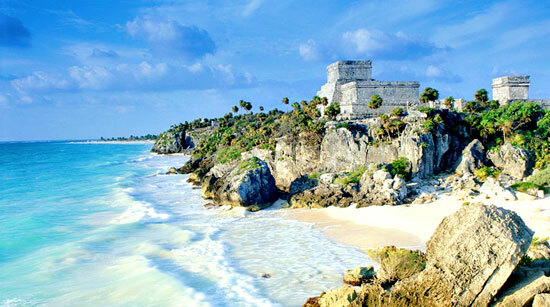 Tulum’s greatest attraction is its location. It stands on a bluff facing the rising sun looking out on spectacular views of the Caribbean. The Tulum ruins are the only ones built by the sea, so wear your swimsuit and head down to the beach for a refreshing dip. Explore underground rivers, get a close-up look at jungle animals, birds and insects, swim in freshwater cenotes and zip-line through the dense Yucatan jungle at an eco-park. Riviera Maya eco parks are located in the jungle near resort areas. Eco parks are host to authentic Mayan ruins, tropical birds and diverse wildlife, million-year-old caves decorated with stalactite formations, and interesting ways to explore these large areas. Many of the larger eco theme parks are all-inclusive, offering visitors unlimited food and drinks, a price advantage for families. Xcaret and Xel Ha theme parks have a large variety of cool eco-adventure activities all in one place—very convenient if you need to entertain kids of different ages. Younger children will be happy with the playgrounds, wading pools and tamer wildlife attractions (Xcaret has a butterfly pavilion and turtles), while older kids can rock climb, zip line, snorkel or swim with dolphins. The Sian Ka’an Biosphere Reserve, a UNESCO site, offers bird watching, kayaking, fly fishing and small boat tours.